Andrea Wulf's book The Invention of Nature: Alexander von Humboldt's New World was on Esri president Jack Dangermond's mind when he opened the 2016 Geodesign Summit. Holding up a copy, Dangermond praised Wulf's biography of Humboldt, a German naturalist and geographer whom the author has called "nature's prophet" and whose geographic explorations and scientific observations 200 years ago still impact how people think about nature today: as a complex, inter-connected system. "You and I are living in a world that's changing rapidly," he said. "We are challenged [by] our population growth. And the footprint of that and its impact—on nature, on climate change, and on just about everything—is enormous." "It's why we are so passionate about trying to create a better future, considering science and our best design and technology," Dangermond said. "The world needs you, and the world needs you to be inspired to grasp this whole set of methodologies and tools to work desperately to alter the course of what's going on. Because the arrows are going in the wrong direction by any measure. The challenge for geodesigners is to turn those arrows around." 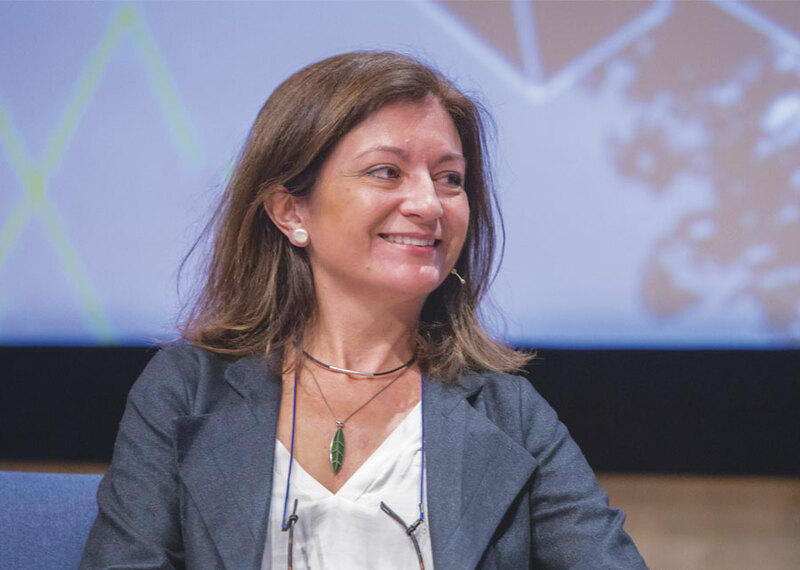 One geodesigner who is making strides in the right direction is Spanish landscape architect, urban planner, and architect Arancha Muñoz-Criado. In introducing her to the audience, Dangermond described her as "one of the greatest geodesigners I've ever met." "I grew up in a beautiful area in Spain with pristine beaches, mountains [overlooking] the seas, and wonderful terraces full of almond trees and vineyards," Muñoz-Criado said. "Suddenly [the village] grew very, very rapidly," said Muñoz-Criado. "It brought a lot of money and resources for the local people, so everybody was happy. But development was allowed anywhere, and that was a total disaster." "I thought there was another way of growing: we could grow but grow well, preserving the character and preserving the landscape of the place," she said. "Every time I went there, I said, 'What a simple idea,'" Muñoz-Criado remembered. "Find out which places…you [want] to preserve before growing, and then develop around these places." "Municipal planners, investors, and [other stakeholders] know that in the green areas, they have some environmental restrictions," she said. "And they just have to click on the GIS map to know where [the restrictions] are." 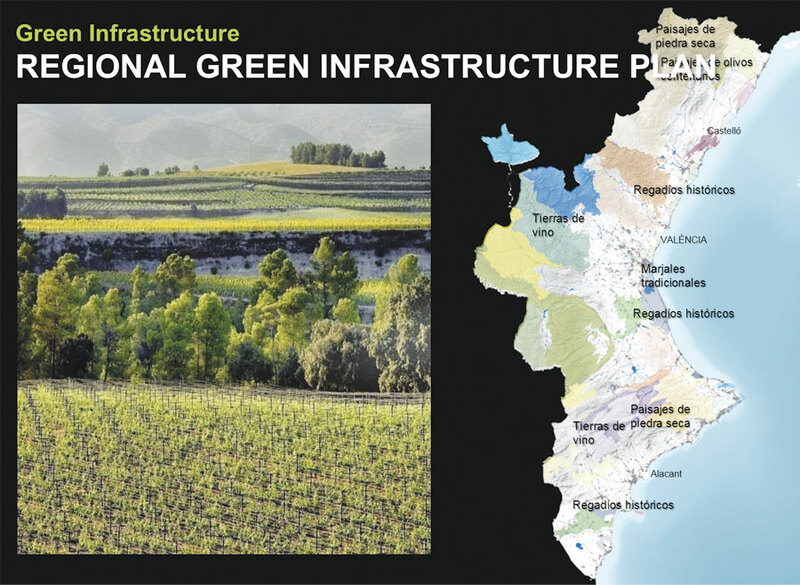 Today, a plan is in place to create a green infrastructure network in the Valencia region that promotes air quality and biodiversity. Rules set at a regional scale protect forests, wetlands, and agricultural areas. Huertas, or family gardens, are encouraged. In these gardens, landowners grow vegetables, such as tomatoes and onions, and then sell them at local farmers' markets. Land is being set aside for bike paths, pedestrian walkways, urban gardens, green spaces, and urban parks. Views considered scenic or historic are protected too. Muñoz-Criado strongly believes that creating green infrastructure doesn't run counter to economic development but, rather, enhances it. "Many cities have destroyed prime agricultural lands, but those lands can be the [food] markets for our cities," she said.